My son goes in phases as to whether he likes, tolerates or rejects bathtime. Right now we’re in a rejection phase. 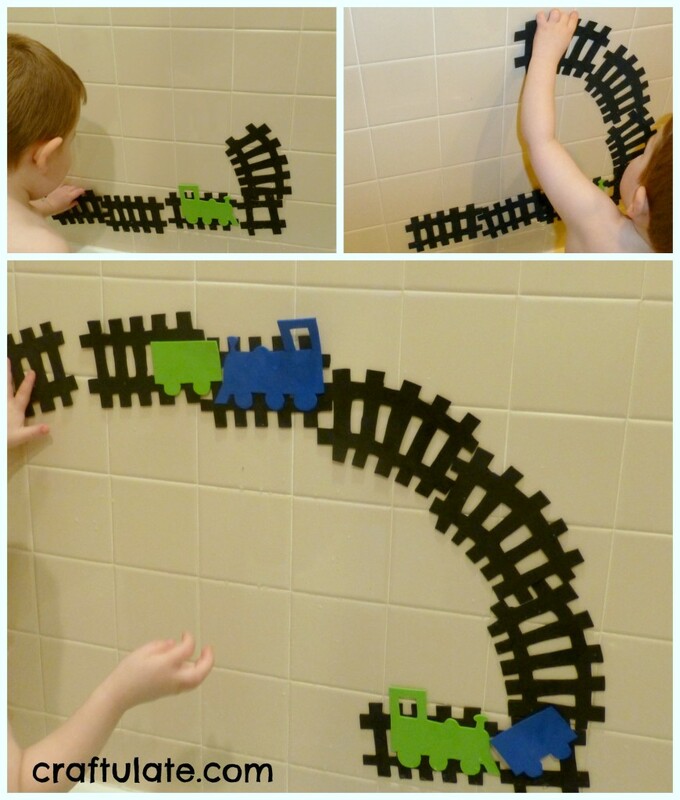 He is utterly obsessed with trains and building tracks so I decided to make his own version for the bath! 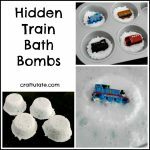 I used craft foam as it sticks easily to tiles or the side of the bath when a little water is applied. I cut out some tracks from black foam which is actually harder than it looks, especially if you want them to be even. Then I cut out the outlines of two trains and two tenders/carriages from green and blue craft foam. They were a LOT easier! 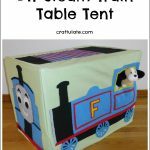 I have to say that F absolutely adored the train set. In fact I wasn’t sure whether I’d ever get him OUT of the bath! 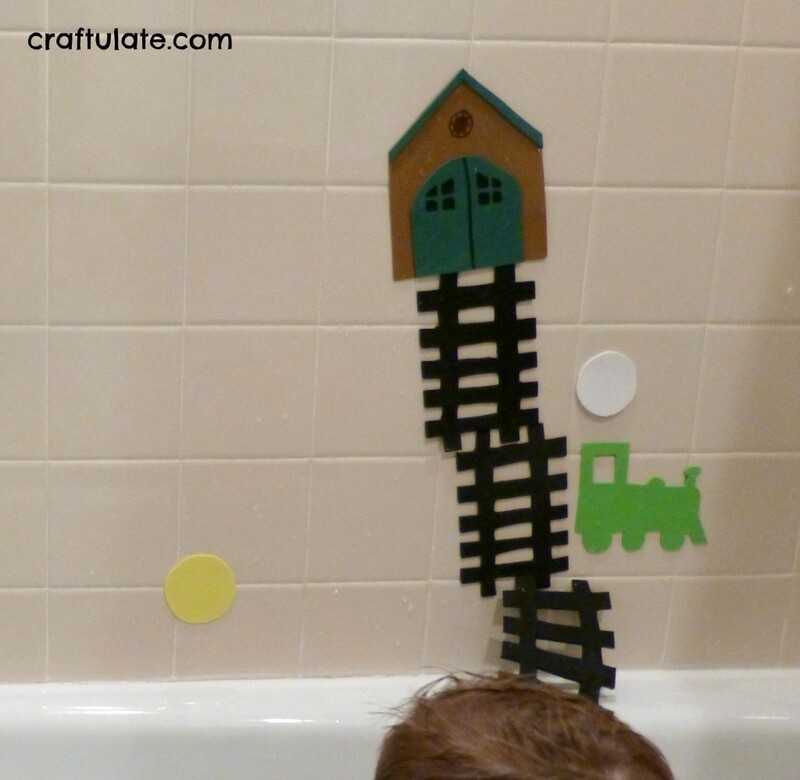 He built a track on the tiles above the bath first. Then he experimented with making a track on the sides and edge of the bath. 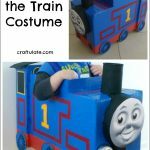 He kept quoting lines from Blue Train, Green Train – his favorite Thomas & Friends book right now. This got me thinking! Before his next bath time, I made some more track (because I hadn’t provided enough, it appears) and also a sun, moon and a shed. The shed was made with brown foam with some green foam hot-glued on to add doors and roof detail. Then I used a permanent marker to add further detail. Here’s the new track he built for “up peeps the yellow sun, blue train Thomas starts his run”. 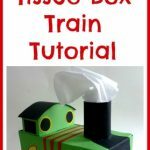 And here’s how he adapted the track for “up peeps the white moon, green train Percy starts soon”. When the engines went to the shed to sleep – he wasn’t impressed that the shed doors didn’t open, but we worked out the trains fit behind the shed! 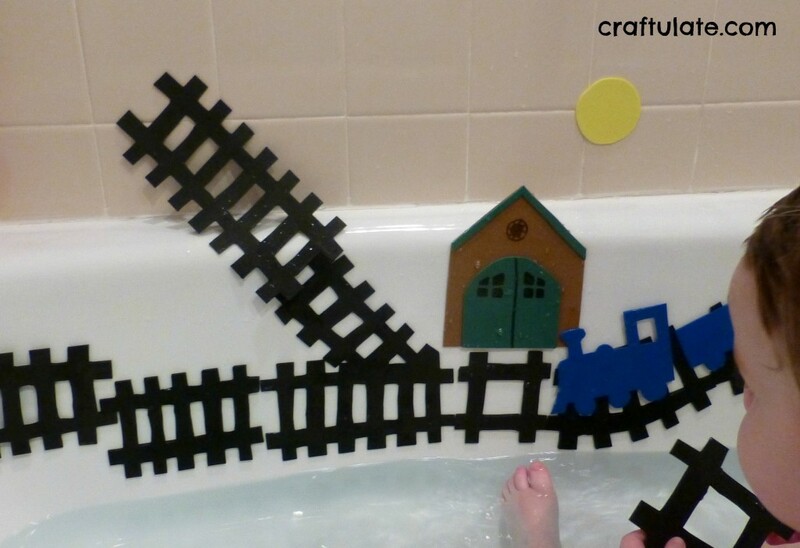 After our second time playing with this train set I heard him request “more bath”. Now *that* doesn’t happen too often around here! This looks so much fun! I bet your little engineer was in heaven 🙂 I know mine would, he’s also very much into trains. So much so that I even made a birthday countdown for him in the shape of a train. Is it the water that makes the foam stick the the tub and walls? Make sure the foamies come off the wall after bath time and are at least given a semi-hearted attempt at a run through rinse water. You do NOT want to know just how gross that can get quickly when you combine slightly dirty child, soap scum that naturally occurs in the process of the child being in the tub, and the sloughed off skin cells that are in the water too. I know it sounds oh so gross, and it is, but the worst part is that it can start a mould process that rendered this mommy into “throw it out, I’ll make you new letters and numbers!” even though, as was stated, it can be really tricky getting things even, and interior spaces, like between ties in a railroad or the spaces in letters that have closed loops, are a bit frustrating when mommy is low on coffee and patience! Our best idea for drying, and also a great finger grip strengthening exercise as well as fine motor control, was to use clothespins and hang them on a piece of clothesline wire we strung along the back of a couple chairs. They are typically dry rather quickly, at least in my locale (Moncton, NB, Canada). A small-gauge wire clothes rack would also work well, as would using the clothespins to put them onto the side of any open-grate mesh shelving units/organizers. For the little odds and ends, we just laid them on a towel for maybe 15 minutes then put them in an old mesh lingerie bag that no longer had a functional zipper. 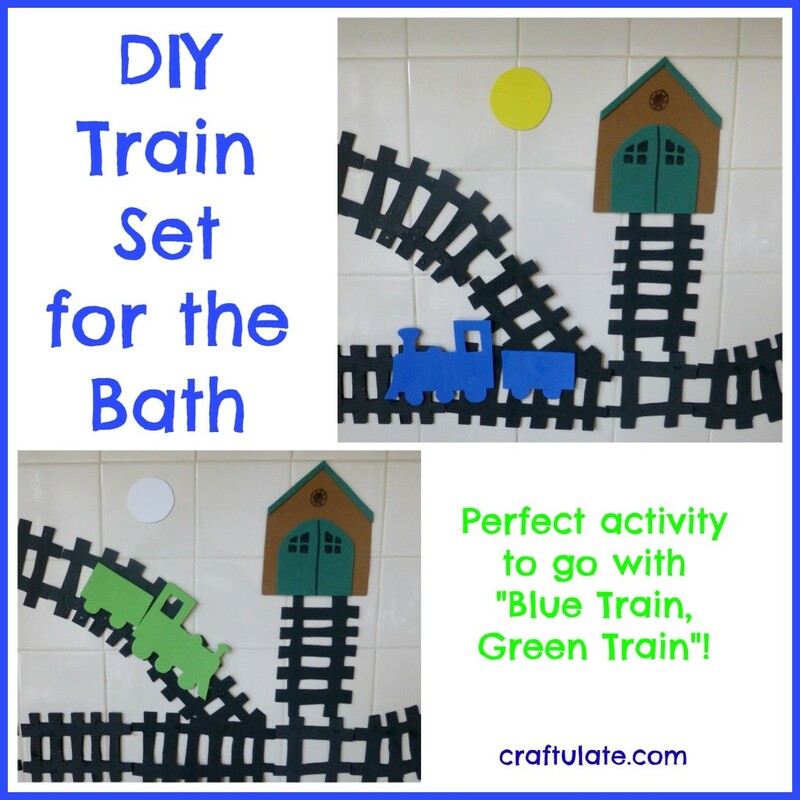 It is a phenomenal idea and is so easy to adapt to whatever interests your child. any shape that traditionally layers well – doors on the shed were an excellent example of that here. googly eyes – even making them before they go in the tub results in everyone laughing till they’re crying with sore tummies/ribs, trust me on this one. And just about any other lightweight, non-porous material that can be hot-glue affixed and still remain on the wall when wet, is fair game. For the record, though, don’t do what I did. I accidentally used the glitter glue on something and well, that stuff gets EVERYWHERE on my child, and doesn’t come off easily. Thanks so much for this, Pauline! Lots of great ideas here and we’ll definitely try to keep them clean! Sorry about the long-winded reply. Feel free to cut’n’paste into an addendum document if you wish.